The government issued a draft notification on 07 August 2018 in which it gave a green signal to the ‘ICE-vehicles to be retrofitted with full-electric kits’. India took it as a challenge and just within 10 months, it brought the first retrofitted EV which has been registered in Telangana RTO (Regional Transport Office), Andhra Pradesh. Before five months i.e. 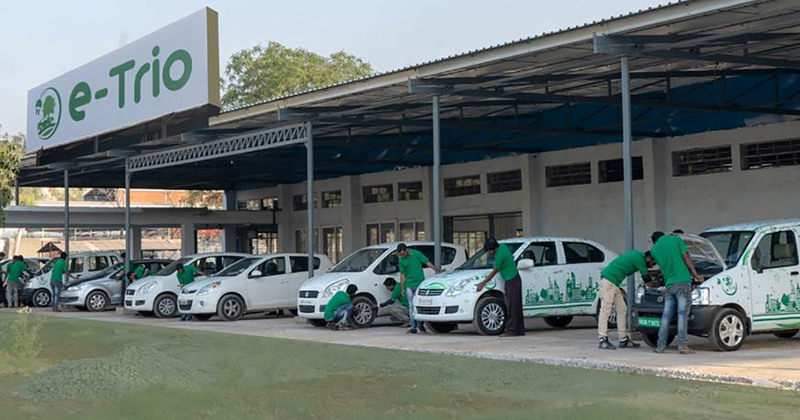 on 12th November 2018, a leading publication reported that the retrofitted Electric Vehicle car kits are being under construction by the E-Trio Automobiles which is a Telangana-based start-up. It is claimed that the company was the very first company to get a green signal from the ARAI for the retrofitted car kits in the vehicles like Wagon R hatchbacks and Maruti Alto. The founder of the company Mr Sathya Yalamanchili has had success in obtaining necessary approvals/registrations from the RTO (Regional Transport Office), Telangana for the first car of the brand i.e. 2006 Maruti Suzuki Alto. The company claimed that there are no gears in the retrofitted EV instead comes with swift acceleration. The car on a single charge can travel up to 150 km. The E-Trio can convert 1,000 cars in a month in the industry. The company also confirmed that the kits and retrofitted cars are ready to hit the markets. The company got the retrofitted kits from China and Korea while the ‘Controller’ for the kit has been developed in Telangana itself. The company said that they are testing the retrofitted cars from past two years and it aims to manufacture at least 5,000 cars in the Fiscal Year 2019-20.